Chlorine removing bath filter for bath tub spouts in whte, chrome and transparent blue. Lasts 25 to 50 baths, depending on the bth tub size. The Sprite Bath Ball filter and conditioner uses the same chlorgon media as Sprite shower filters, removing chlorine, sediment, bad odors and other harmful contaminants from your bathwater. 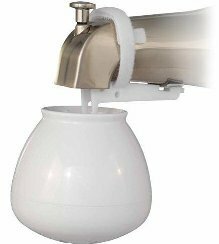 This system attaches easily to any bathtub spout using its universal detachable harness. It is available in chrome, white and transparent. The included filter lasts 50 baths with a 50-gallon tub and up to 25 gallons for larger tubs.